The Black and Decker Air fryer is a perfect piece of kitchenware that allows you to fry and enjoy your favorite dishes with very little to no oil. When the health risks of deep frying with gallons of oil are considered, air fryers provide the best alternative to enjoy the crispy and delicious meals without guilt or worry. We’ve taken our time to use and study the Black and Decker Air fryer to guide you before making your purchase, we present to you our Black and Decker Air fryer reviews(Model HF110SBD), let’s check if it’s worth the money. 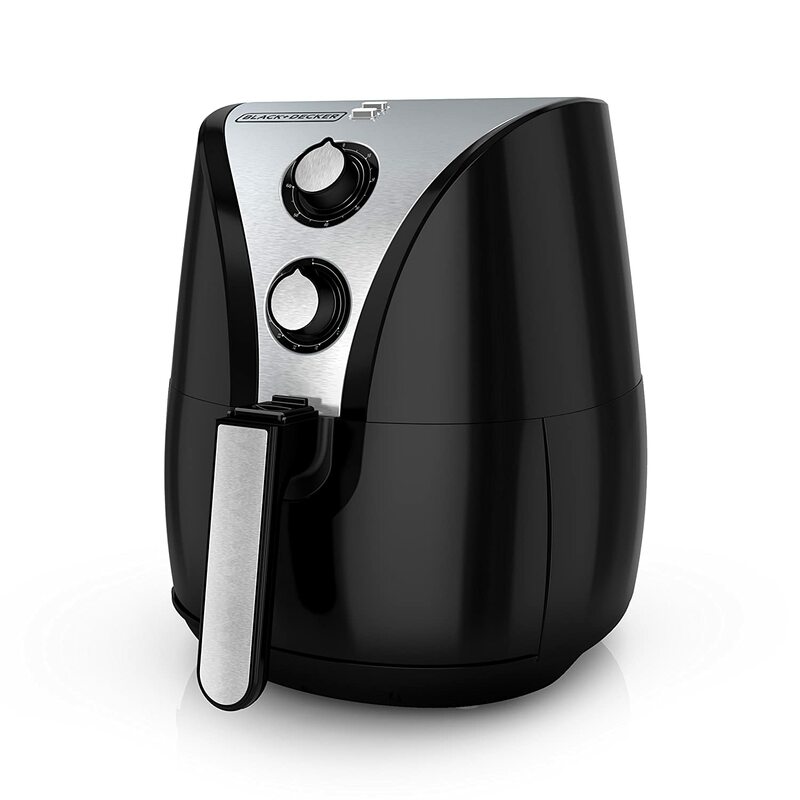 What is the Black and Decker Air Fryer? How does the Black and Decker Air fryer fare with the competition? The Black and Decker Air fryer uses dual convection fans to circulate hot air around your food to air fry them, giving the food a crispy texture on the outside and a delicious taste as in deep frying. The Black and Decker is capable of holding 2 liters of food. 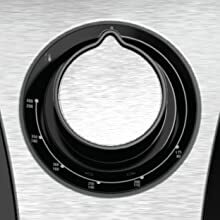 The control has two indicator lights that indicate when the system is on and when the preheat temperature is reached. It weighs 12.6lbs and measures 11.1 x 9.8 x 11.5 inches in dimensions. Let’s skip this now to see why you need this superb gizmo. If you start to think about the health risks of oil with deep frying, you will understand why air fryers are the next best things, but why Black and Decker? The Black and Decker’s simple design makes it easy to use and clean. No issues. Aside from frying, the Black and Decker can also be used to bake cakes, make desserts and much more. The air fryer has a lot of benefits due to its many features, let’s check those out below. The Black n Decker uses two powerful convection fans to circulate hot, super-heated air around the food. This implies that the food gets cooked evenly and gets this crispy texture and a delicious taste as with deep frying. What makes the Black and Decker better is that it does this with little to no oil, reducing the fat content in your favorite foods for you to enjoy without feelings of worries and guilt. It has a capacity of 2 liters. That is about 8 cups, enough to serve two to four people. 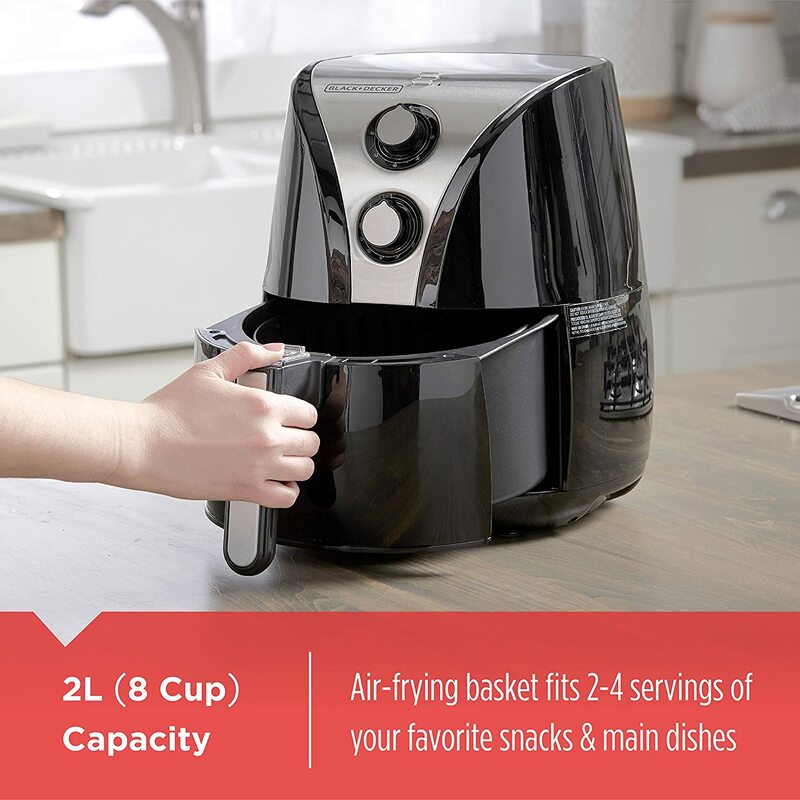 The Black and Decker Air fryer comes with a non-stick basket, you could easily load in your food and it is also easy to clean up due to the non-stickiness of the basket. There is also no mess from oil splash as little or no oil is used. The temperature range is between 175F to 400F, this means you get a perfectly cooked food at a faster rate when compared with deep frying or even convection ovens. The system has two indicator lights, one shows when the air fryer is on while the other turns off when the preheat temperature is reached. Other safety designs were inculcated into this beautiful piece, the air fryer shuts off after the set time to avoid overcooking and also shuts off after 60 minutes of inactivity, the basket parts are also dishwasher safe for easy and safe cleaning. A User’s Manual, to guide your proper use of the product. Using the Black n Decker is very easy, just remove the basket, load your food, put the basket in and set your timer, then leave the rest for the Black n Decker. You will then have your perfectly crispy delicious air fried food without the calories. Cleaning up after use is also easy, the basket is dishwasher safe and non-sticky, it doesn’t get messed up due to splatter from oil, it is easy to clean without trouble. Because the Black and Decker Air fryer is very popular among air fryer enthusiasts, it is often the subject of comparison with other air fryers and even actifry. Let’s check out how this amazing product stacks up against the competition. About size, the Black n Decker has a capacity of 2 liters, while there are some Philips Air fryers within this capacity range, there are also those with larger capacity such as the Philips Avance XL. Talking of controls, the Black and Decker Air fryer has a manual interface while the Philip Air fryers have a digital interface. In the aspect of functionality, in this battle of the Black and Decker VS Philips Air fryer, the Philips model offers a little more options than the Black and Decker Airfryer. Overall, from an economic point of view, one would want to go for the Black and Decker Air fryer, it offers so much for so less. Some peeps also try to compare the Black and Decker with Actifry, it’s just so interesting to find out. In this battle of the Black and Decker VS Actifry, let’s check out who comes on top. Both of this different products work with the same technology, hot air circulation at high speed to air fry food without oil. While the Actrify maxes out at 338F, the Black and Decker can go further, as high as 400F in temperature. The Actifry in built timer automatically shuts off after 99minutes while the Black n Decker shuts off after 60minutes probably due to the higher temperature difference. While the Black n Decker has a capacity of 2 liters, the Actifry can hold slightly more for a single batch. Overall, they both offer safe and healthy ways to enjoy tasty meals without repercussions health-wise, up to 80% less fat. The air fryer is able to cook with little to no oil. The air fryer can also cook other types of food apart from air frying. It has a large basket that can hold up to 2 liters of food. There is a high level of safety mechanisms inbuilt into the air fryer. It is able to cook foods evenly and faster due to the dual convection fans. Some people still find the 2-liter capacity too small for a meal for plenty guests. The Black and Decker is designed to meet North American standards and hence cannot be used in all countries. You will need to handle the air fryer with care because the exterior is prone to scratch and dents. Verdict – The Black and Decker is a perfect alternative to deep frying, it is reasonably priced and it is even worth more than the money considering the quality and benefits it has to give. Air frying is the next best thing as far as eating healthy is concerned. The Black n Decker Air fryer offers this alternative to better your health in a cheap and affordable product. Enjoy your favorite dishes cooked with the Black and Decker Air fryer without the calories, without the guilt and without the worries.